Providing living rooms with a casual styled comfort and a large sitting space, this grand sofa complements large living areas with a spacious furniture style that is relaxed and comfortable. American made in Hickory, North Carolina, this upholstered slipcover sofa features a certified sustainable kiln-dried hardwood frame used for strength and durability with a Flexolater spring system that provides supported comfort while preventing furniture squeaks. 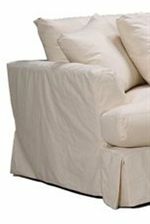 Seat cushions made from a multilayer soy or plant-based polyfoam wrapped in fiber-down blend and encased in downproof ticking bring a comfortable feel to the cushions of this sofa. Complete with a kick style skirt and contemporary flared arms, this extra large sofa makes a charming living room accent. Coordinating (un-pictured) 74" apartment sized sofa and 84" standard sized sofa also available. The 0778 Grand, Extra Long Slipcover Sofa with Pleated Skirt and Flared Arms by McCreary Modern at AHFA in the area. Product availability may vary. Contact us for the most current availability on this product.